Superhero Bystanders from Fandor Keyframe on Vimeo. Whether it’s The Avengers, The Dark Knight Rises, or Green Lantern, the crowd shots always look pretty much the same. In some ways, they recall the famous “Spielberg Face”—that is, people gazing in wonder at something just offscreen—only without the purposeful framing and overarching sense of childlike awe Spielberg’s movies have. The Spielberg Face from Fandor Keyframe on Vimeo. 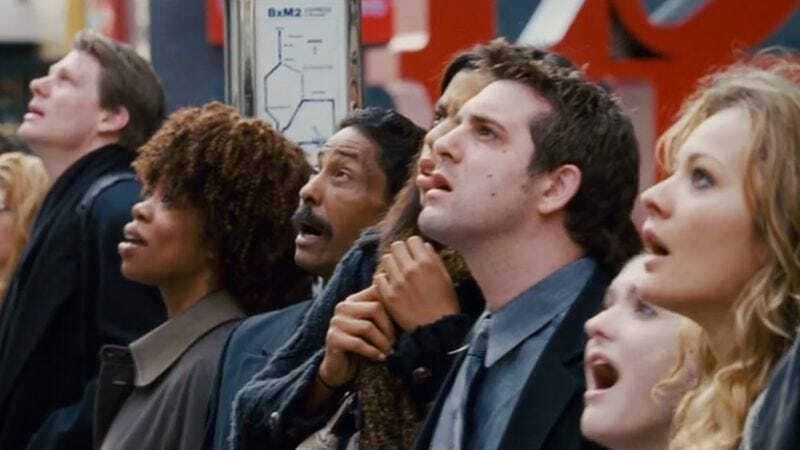 The essay at Fandor suggests an alternate tack: “What if movies showed crowds taking action,” the essay asks, “instead of waiting to be saved?” The answer to that is provided by clips from Sam Raimi’s first two Spider-Man movies from 2002 and 2004. In these films, both set in New York, the citizens do their part in razzing the villain and protecting the hero. After all those dumb crowd shots, it’s a refreshing change of pace.